Would you like to create a multilingual website quickly and easily? Then MultilingualPress 3 (MLP 3) is the perfect choice for you. What exactly can MultilingualPress 3 do? Is there a demo version of MultilingualPress 3? What are the requirements for using MultilingualPress 3? What is the difference between MultilingualPress 3 and MultilingualPress 2? Can I upgrade from MultilingualPress 2 to MultilingualPress 3? 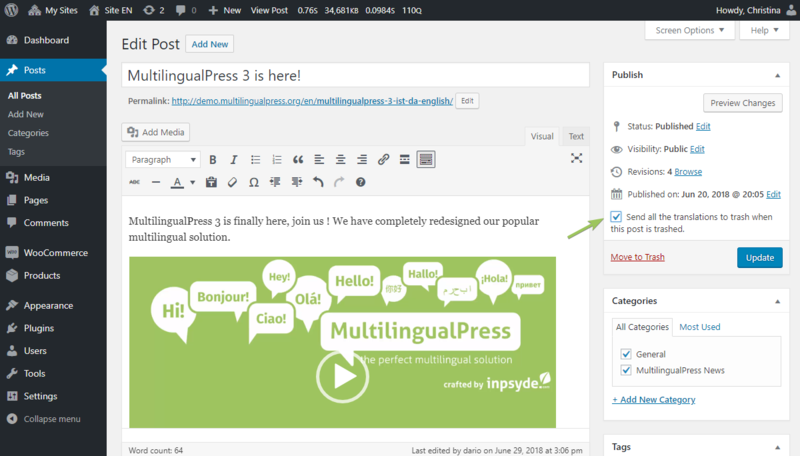 MultilingualPress 3 establishes language connections between various pages on a WordPress multisite. This enables you to display content to your website visitors in their own language. To do so, you set up each different language version of your website as a site within a WordPress multisite. Then you link the translated content using MultilingualPress 3. Content can include posts, pages, custom post types or even so-called taxonomies. This last designation includes categories and keywords, for example. Our plugin also helps you to forward website visitors to their appropriate language version. It also automatically assists you with search engine optimization for your multilingual website. Yes! If you want to see what MultilingualPress 3 can do before buying it to make sure our product is right for you, please visit our demo site demo.multilingualpress.org. We have set up a multilingual site there with WooCommerce Shop. If something is missing or you have any questions, feel free to contact us at support@multilingualpress.org. You prefer watching a video instead of reading a long text? You want to know what MultilingualPress looks like in the backend and be convinced of its ease of use before buying the product? Then take a look at our product video here. If the video did not answer all your questions, please continue reading on this page or contact us. If you don’t have WordPress Multisite yet, please follow our guide Installing and setting up WordPress Multisite. 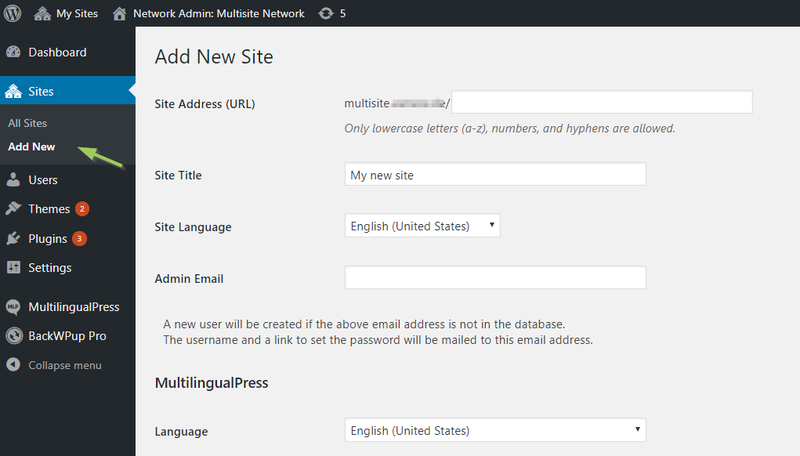 You can find more tutorials for WordPress Multisite in our guide WordPress Multisite 1×1. Please note: you can’t update MLP2 to MLP3 yet. This is a complete refactor. Therefore an update is not possible yet. Also please do not use version 2 and version 3 together in one multisite. 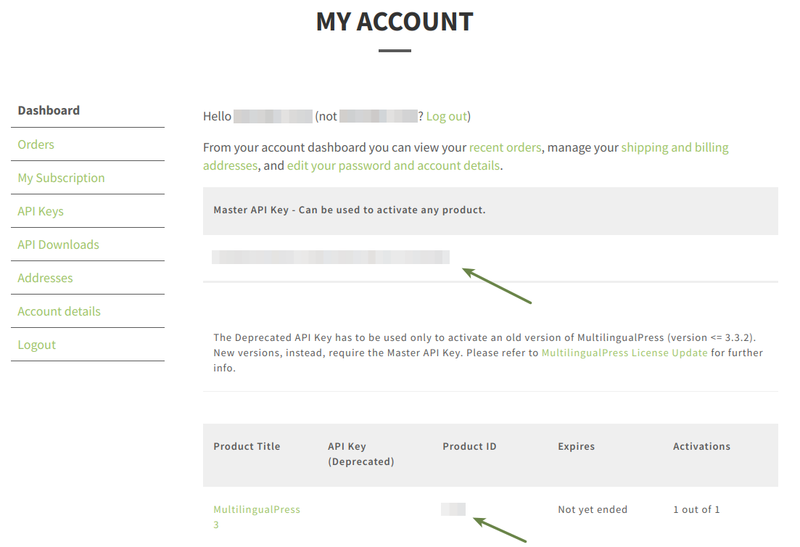 After you have purchased MultilingualPress, please log in to your customer account and download the product. Go to My Sites → Network Admin → Plugins, upload the plugin and activate it across the network. 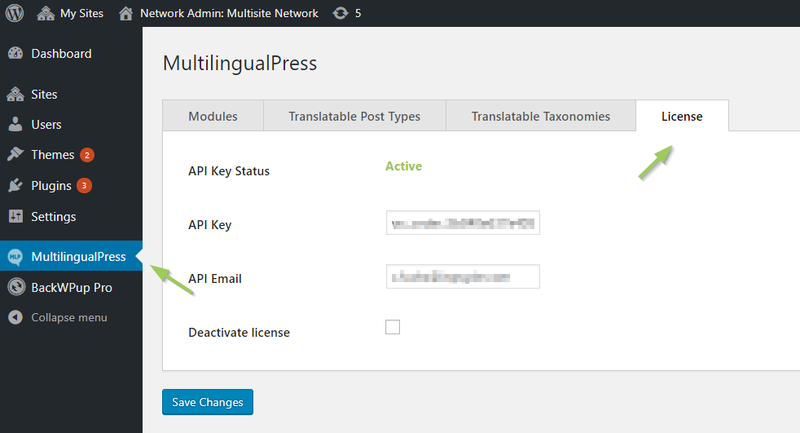 Then go to My Sites → Network Admin → MultilingualPress and enter your API Key and API Email in the License tab. These can be found in your customer account. To change global settings, go to My Sites → Network Admin → MultilingualPress. In addition to the License tab, you will find here three tabs with settings. These apply for all sites. Alternative language title: activates the feature “Alternative language title”. 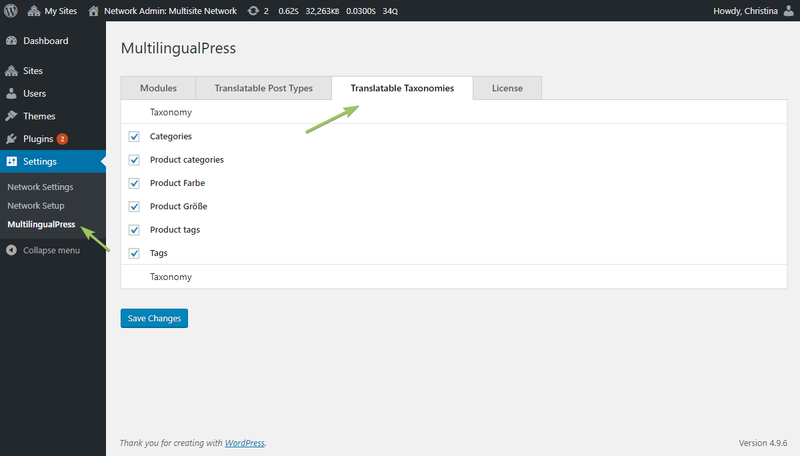 If you check this box, a field for the alternative language title will appear on the MultilingualPress settings page for the website in question. This will be displayed in the Admin menu instead of the website title that was set when the site was created. Redirect: activates the feature for automatic language redirection. On the MultilingualPress settings page of the website in question, a box will appear to activate automatic language redirection. If you then check this box, visitors to the website will be automatically redirected to the correct language version of the website based on the language in their browser settings when they access the site. Trasher: if this checkbox is activated, when editing a post, in the “Publish” meta box a checkbox will be displayed saying “Send all the translations to trash when this post is trashed.” Check this box to delete all translations of the post simultaneously if you move one of them to the trash. Language Manager: This enables the Language Manager which allows you to include custom languages or override existing ones. You can find the Language Manager under My Sites → Network Admin → MultilingualPress → Language Manager. Click the New Language button to add a new line for a language to be added and enter your preferred settings in the fields. You can also search for an existing language and adapt it. 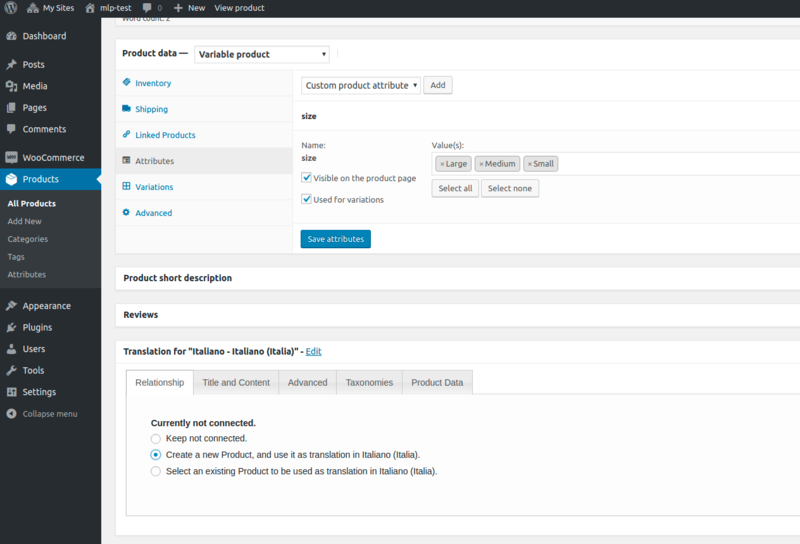 WooCommerce: This module enables WooCommerce support and allows you to translate WooCommerce products, orders and coupons but also the product attributes typical to WooCommerce (product categories and product tags). Activate MultilingualPress Trasher checkbox to move all translations of a specific post into the trash simultaneously. Translatable Post Types: All content types (post types) are displayed here for which MultilingualPress can create a language relation. Select the type of your choice. The corresponding meta boxes will only be available for this post types during editing. For instance, if you only select Posts, then you will only be able to link content in different languages for posts. Translatable Taxonomies: Like Translatable Post Types, but for taxonomies. Taxonomies include for example categories or tags. Go to My Sites → Network Admin → Sites and click on the button Add New. 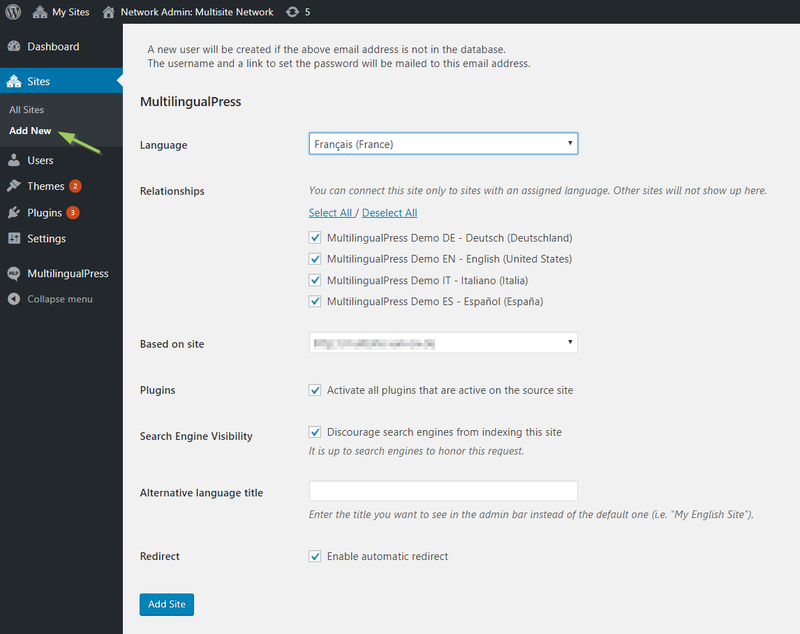 These are all settings of the WordPress multisite that are available without MultilingualPress. Language – This is the language for the translation. For instance, if the content on this website is supposed to be in French, then choose French here. 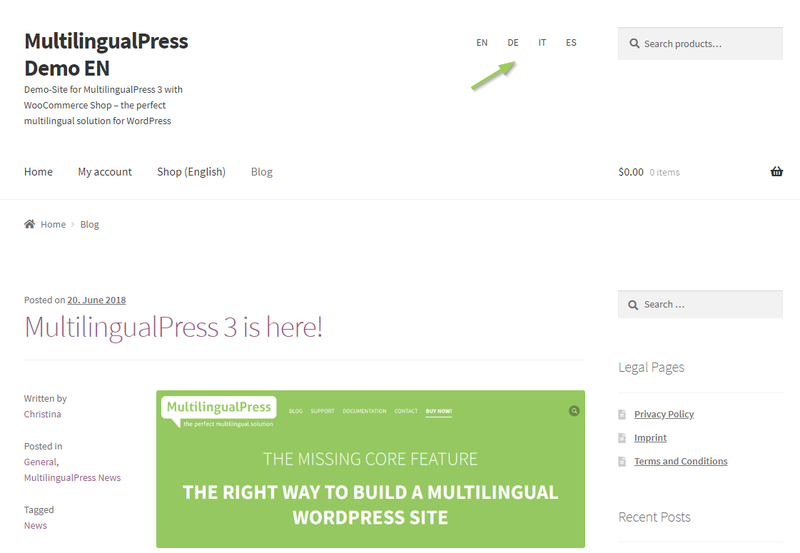 MultilingualPress 3 offers you many more languages to choose from than WordPress. Relationships – The websites you would like to link with this site. For every language into which you would like to translate your site, you should create a website and link them all together. Based on website – If you select a website here, a copy of this website will be generated when you create the new website, saving you lots of work in configuring and creating content. Plugins – Check the box here to activate all plugins on the new website that are active on the source website. Search Engine Visibility – As usual for WordPress, you can check the box here to prevent search engines from indexing the site. Redirect – Check this box to activate automatic language forwarding. This field will only be displayed if you activated the module Redirect in the global settings of MultilingualPress 3. Alternative Language Title – here you can set a title for your website that will be displayed in the Admin menu instead of the title indicated above. This field will only be displayed if you activated the module Alternative language title in the global settings of MultilingualPress 3. 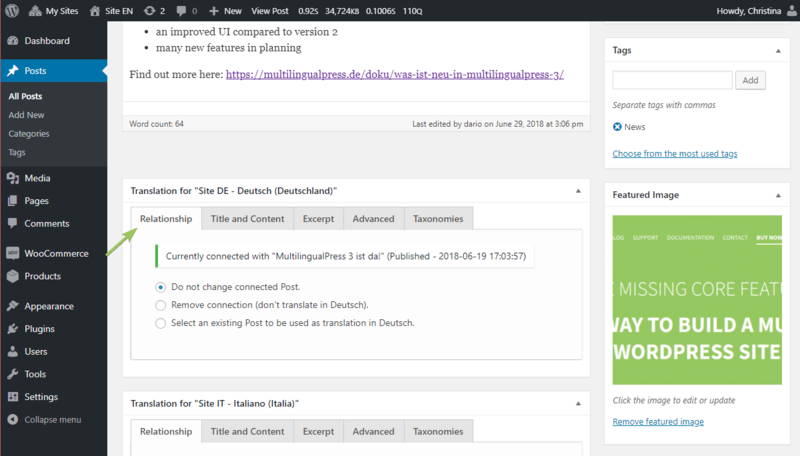 After lots of preparation, we are finally coming to the most important feature of MultilingualPress: translating posts and linking translations together. We make a distinction between translating content types (posts, pages, sites, products etc.) and translating taxonomies (categories, tags etc.). To translate a post, please edit this in one of the sites. Enter your heading, URL and text as normal for this site. Below the editor you will find the MultilingualPress meta boxes to translate the post into other languages, one meta box per language. The meta box includes the following tabs: Relationship, Title and Content, Excerpt, Advanced and Taxonomies. We will briefly explain all tabs here. Enter your settings for the language connection or translation in the tabs and then save the post. Relationship: Here you can specify a language connection, that is, selecting which post is the translation of the post you are currently editing. You have the option of not choosing any translation, creating a new post or setting an existing post as the translation. If a link already exists, you can also remove it. Translating a post with MultilingualPress: set language connection, i.e. link translations together. Title and content: Here you can enter the title and content of the linked post. If you check the box next to Copy source content, this will overwrite the current content of the translation with the content in the post you are translating. Excerpt: In case you want to enter an excerpt for the translation, you can do so here. Advanced: In this tab you can specify the URL (Post Slug) and status (published, draft, pending) of the translation. You also have the option of copying the picture from the original post into the translation. At the bottom, you will find a link that will take you to Edit mode for the translation. Clicking the link opens the linked post for editing. To translate the actual content please switch to the connected post using this link in the editor. Taxonomies: Here you can specify taxonomies (e.g. categories, tags) for the translation. Synchronize taxonomies overwrites all existing taxonomies in the translation with those from the source post. Taxonomies categorize or group together content in WordPress. The standard taxonomies are categories and tags. There are also so-called custom taxonomies that are supplied by plugins, for instance WooCommerce product features. The different groupings in a taxonomy are called terms. For instance, if you use the tags News and Tips for your posts, then News and Tips are terms within the taxonomy of tags. You can translate taxonomies just like you translate posts. Relationship: Here you can specify the language connection. This means you are connecting the terms of the individual languages together. You have the option of not choosing any translations, creating a new term or setting an existing term as the translation. If a link already exists, you can also remove it. If you create a new tag, visit the Term Data tab to define the term attributes before saving. Term data: Here you can enter the term name, term slug and a description. Many of our customers operate multilingual shops with WooCommerce. Therefore, we would like to briefly address the topic of translating WooCommerce products. Generally, this works exactly the same as for other content types and taxonomies described above. Important: In the global settings of MultilingualPress, choose all WooCommerce content types and taxonomies that you want to be translatable. For WooCommerce this could mean products, coupons, orders, product tags and/or product categories. 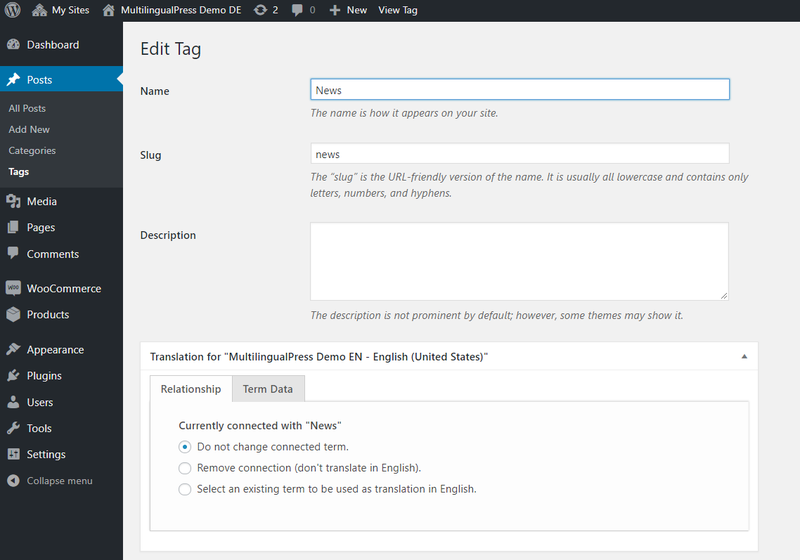 If you have set products to be translatable, then you will find the MultilingualPress meta boxes below the product editor. As usual, you can link products together, translate titles, URLs, excerpts and change any other settings as you like. Translating WooCommerce products and linking the translations together. Compared with the previous meta boxes of translation, a new tab specification is available: “Product Data”. Through this tab is possible to set several fields and/or options to properly create or update the related remote site product. Depending on the type of product selected, Product Data tab fields update accordingly with the data available for that type of product. Here follows a brief description of the specific options related to each product type that is possible to set. For the Simple Product, the Regular Price and Sale Price fields are available in the metabox to save and copy prices to the related language site product. As we see in the following pictures, files in the Downloadable files area in the WooCommerce product, can also be copied to the related language site product through the proper checkbox in the translation metabox. In a similar way Upsells and Cross sells products can be copied to the related product in the remote language site. Pay attention: in order to properly use this option, the selected Upsells and Cross sells products should exists and be connected in the related destination site beforehand. When we use a Grouped Product, checkboxes of the Grouped and Upsells products in the translation metabox can be set to copy them to the related destination site product. Like the Upsell and Cross sell product in the previous paragraph, it is important to remember that the products should exist and be connected in the related destination site beforehand. In case we use the External/Affiliate product type, in the product General panel, the fields Product URL and Button Text are available to copy the related values to the remote language site product. Finally, in case we deal with Variable Product, it is possible to copy all related data by selecting the Attribute and Variations checkboxes. After examination of the specific options related to each product type, we are now going to take a look to the common Options shared across several product types. To specify additional product characteristics for other languages, that are not addressed in the previous paragraphs, edit the product in the corresponding site within your multisite. Please note: WooCommerce shops for individual versions in different languages are independent of one another and have separate shopping carts, inventory etc. MultilingualPress merely links the content together. But if you need a solution for a single stock shared by all shops in the multisite, we have another plugin that accomplish that task: OneStock for WooCommerce. How will visitors to your website access the version of your multilingual website in a language they speak and understand? There are two options for this: either automatic language redirection or selecting the language from a menu. Go to My Sites → Network Admin → Sites. Edit the sites that contain your website in one language and set a language in the tab MultilingualPress. When you have assigned a language to every site, link them together. To do so, go to My Sites → Network Admin → Sites. Edit the sites and specify the connections in the tab MultilingualPress. You already completed steps 2 to 4 when translating the content. In this case, you create a menu for each site within your multisite that contains links to the different language versions of your content. 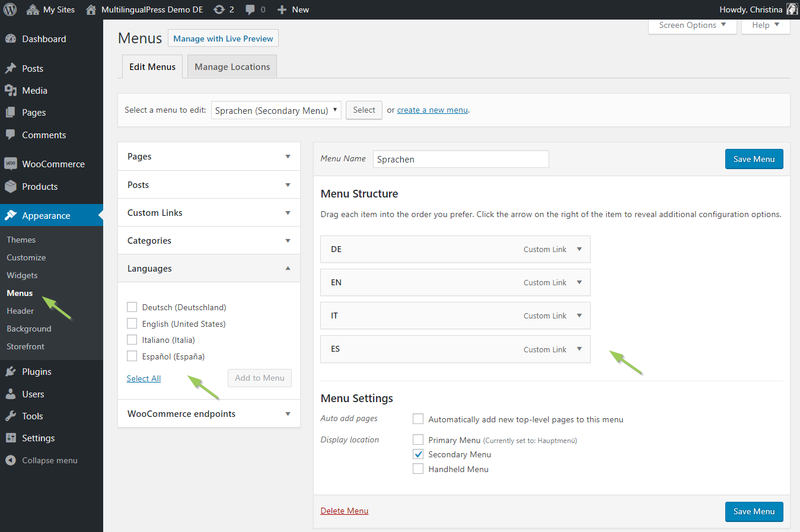 Then, assign a location for the menu as usual in WordPress. You can also use the widget Navigation menu to display your menu in the sidebar. 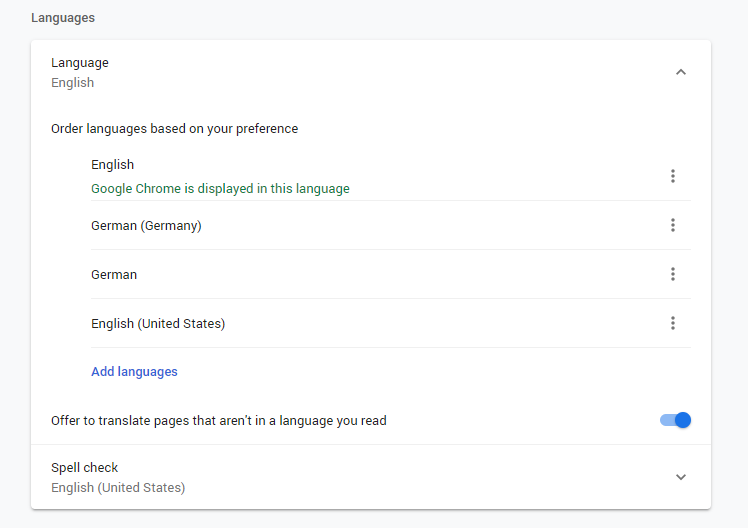 If you linked translations together when translating a post, a site etc., then your visitors can switch between the different translations of the post, site etc. using this menu. Note: If the Languages are not available when creating the menu, please click on Screen Options in the top right and check the Languages option. If you are operating a website professionally, it is also important for you to pay attention to search engine optimization (SEO). For multilingual websites, you are sure to encounter the term hreflang in connection with SEO. hreflang is a link attribute (rel=”alternate” hreflang=”x”) that is displayed in the heading of a site. It signals to the search engine that the website is multilingual. This also indicates the language in which the currently displayed content is written and in which other languages this is available, as well as precisely where. If you implement hreflang incorrectly in your multilingual website, this could cause major problems. This includes dreaded duplicate content, or search engines showing the wrong language version in search results. MultilingualPress automatically displays hreflang correctly for you once you have linked the translations together. See section Translate and link content with MultilingualPress 3. You can find detailled info about hreflang in the document: What is hreflang and how to use it in MultilingualPress. Upgrading from MultilingualPress 2 to MultilingualPress 3 is not currently possible. However, we already planned a migration module on the long term. You are using MLP 2 and would like to switch to the new version? You can absolutely install the new version. However, you will have to manually reconfigure all settings and language connections. Note: If you purchase MultilingualPress 3, you also buy ongoing support for Version 2.